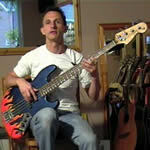 Learn bass grooves with this Guitar Tuition DVD. The 2nd in the Learn Bass Guitar series will teach you all you need to know about learning and improvising Bass Grooves. Fed up of not being able to play along with a song you haven't learnt yet? Finding it hard to come up with an idea for a new song? This DVD will really bring your Bass playing to life and will provide you with plenty of grooves you can pull out of a hat when needed. Includes backing tracks with the bass parts missing for you to play along to. The techchniques involved are generic so can be applied in all keys and all chord progressions.